1. Which is a clientless VPN solution for mobile workers? 2. For a VPN, which technology provides secure remote access over broadband? 3. A technician is talking to a colleague at a rival company and comparing DSL transfer rates between the two companies. Both companies are in the same city, use the same service provider, and have the same rate/service plan. What is the explanation for why Company A reports higher download speeds than Company B? Company B shares the conection to the DSLAM with more clients than Company A. Company A only uses microfilters on branch locations. Company A is closer to the service provider. Company B has a higher volume of POTS voice traffic than Company A. 4. How does an SNMP trap aid network monitoring and management? It flags attempts to begin a DoS attack on the network. It collects information for the management station by using polling devices. It reports to the management station by responding to polls. It sends an alert message to the management station when a threshold is reached. Refer to the exhibit. A PC at address 10.1.1.45 is unable to access the Internet. What is the most likely cause of the problem? The NAT pool has been exhausted. Refer to the exhibit. 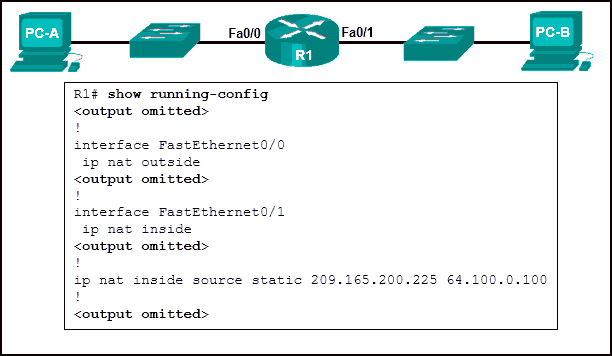 A network administrator has configured routers RTA and RTB, but cannot ping from serial interface to serial interface. Which layer of the OSI model is the most likely cause of the problem? 7. A user is unable to connect to the Internet. The network administrator decides to use the top-down troubleshooting approach. Which action should the administrator perform first? Refer to the exhibit. A network administrator has configured router Edge_Router as shown in the output. Connectivity is failing between Edge_Router and a non-Cisco router running Frame Relay. What should be done to repair this Layer 2 connectivity? 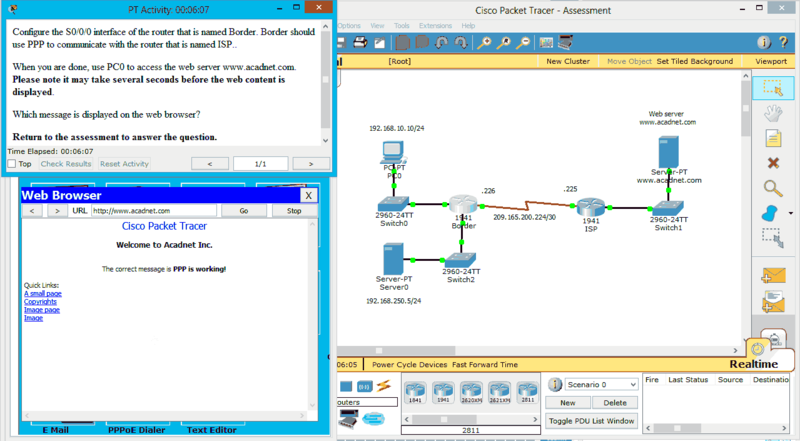 Modify the OSPF process-id from 10 to 1. Issue the frame-relay lmi-type ansi command on interface serial 0/1/0. Issue the ietf keyword when enabling Frame Relay on interface serial 0/1/0. Issue the broadcast keyword when performing static mapping on interface serial 0/1/0. 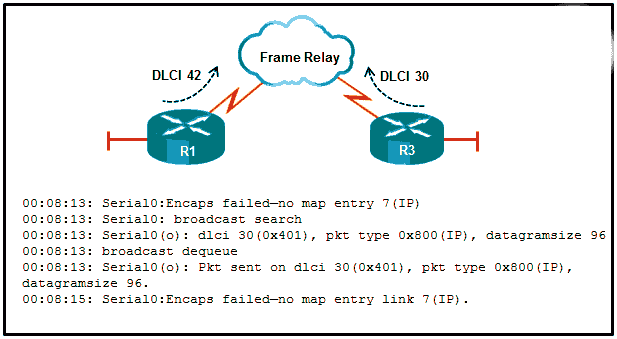 Correct the IP address used in the frame-relay map command. 9. What is an advantage of packet-switched technology over circuit-switched technology? Packet-switched networks do not require an expensive permanent connection to each endpoint. Packet-switched networks can efficiently use multiple routes inside a service provider network. Packet-switched networks usually experience lower latency than circuit-switched networks experience. Packet-switched networks are less susceptible to jitter than circuit-switched networks are. 10. A network administrator has moved the company intranet web server from a switch port to a dedicated router interface. How can the administrator determine how this change has affected performance and availability on the company intranet? Interview departmental administrative assistants and determine if they think load time for web pages has improved. Compare the hit counts on the company web server for the current week to the values that were recorded in previous weeks. Determine performance on the intranet by monitoring load times of company web pages from remote sites. Conduct a performance test and compare with the baseline that was established previously. 11. Which statement describes cable? Delivering services over a cable network requires downstream frequencies in the 50 to 860 MHz range, and upstream frequencies in the 5 to 42 MHz range. Each cable subscriber has dedicated upstream and downstream bandwidth. Cable subscribers may expect up to 27 Mbps of bandwidth on the upload path. 12. Which syslog entry has a severity code that indicates the most serious situation? Mar 17 06:42:21: 10.1.1.1 %CDP-4-DUPLEX_MISMATCH: duplex mismatch discovered on FastEthernet0/3 (not half duplex), with NA-1.30.foo.com FastEthernet0/24 (half duplex). After the command R3# debug frame-relay packet is executed, a ping is issued from R3 to R1 but is unsuccessful. Based on the output of the debug command shown in the graphic and the router configuration, what is the problem? An incorrect IP address exists in the map statement. No clock rate has been configured on interface s0. The encapsulation frame-relay command is missing the broadcast keyword. 14. A technician has been asked to configure a broadband connection for a teleworker. The technician has been instructed that all uploads and downloads for the connection must use existing phone lines. Which broadband technology should be used? 15. Which WAN technology uses a fixed payload of 48 bytes and is transported across both switched and permanent virtual circuits? NetFlow can be used to collect performance indicators such as interface errors, CPU usage, and memory usage. NetFlow traffic collectors use a “pull” based model to acquire traffic statistics from ports of interest. 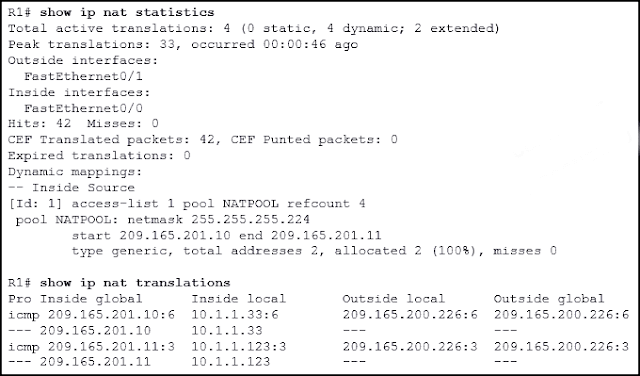 NetFlow can be used to monitor traffic statistics, including packet payload content. 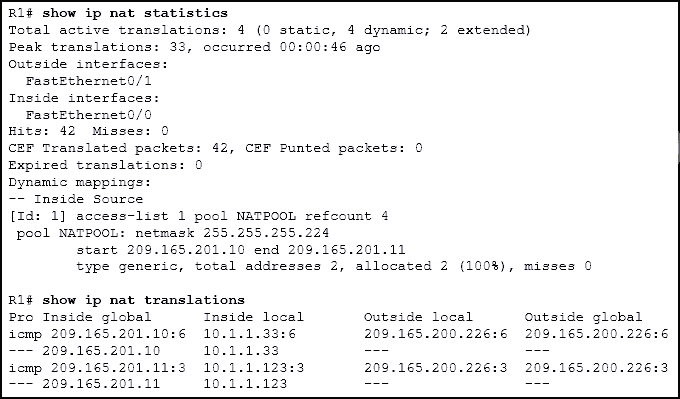 NetFlow is a Cisco-specific feature that enables the collection of detailed traffic profiles. NetFlow can be used to create baseline documentation. NetFlow is a network monitoring and event reporting tool. 18. Which statement is true about NCP? Which message is displayed on the web browser? 21. Which statement is true about the operation of a site-to-site VPN connection? The data is encrypted by the VPN gateway at the sending side and decrypted by the target host. The data is encrypted by the sending host and decrypted by the VPN gateway at the receiving side. The data is encrypted and decrypted by VPN gateways at both the sending and receiving sides. The data is encrypted and decrypted by the sending and target hosts. Filters and splitters allow POTS and DSL traffic to share the same medium. DSL download rates are reduced by large volumes of POTS voice traffic. Service providers deploy DSL in the local loop of the telephone network. DSL is a shared medium that allows many users to share bandwidth available from the DSLAM. Uploads typically offer larger transfer rates than downloads. 26. A company has been assigned the 203.0.113.0/27 block of IP addresses by the ISP. The company has over 6000 internal devices. What type of NAT would be most appropriate for the employee workstations of the company? 28. 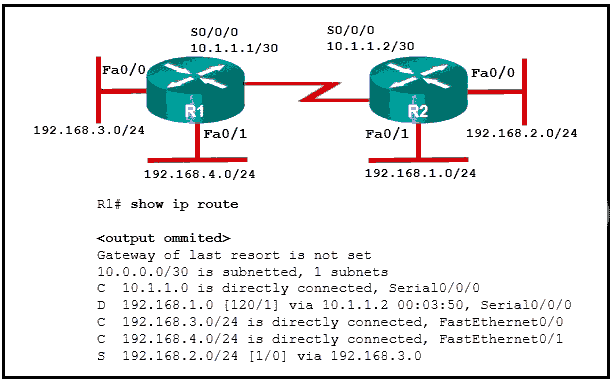 What makes the Cisco EasyVPN application a useful tool for VPN implementation? It ensures that remote workers actually use the VPN for connectivity. It simplifies the configuration tasks for the device that is used as the VPN server. It allows a greater variety of network devices to be used for VPN connections. It provides encryption algorithms unavailable in other systems. 29. What is the purpose of the Cisco Enterprise Architecture? It provides services and functionality to the core layer by grouping various components into a single component that is located in the access layer. It replaces the three-layer hierarchical model with a flat network approach. It reduces overall network traffic by grouping server farms, the management server, corporate intranet, and e-commerce routers in the same layer. It provides an enterprise-wide system network architecture that helps protect, optimize, and grow the network infrastructure that supports the business processes of a company. 30. Which basic network module of the Enterprise Architecture is the fundamental component of a campus design? Refer to the exhibit. An administrator is trying to configure PAT on R1, but PC-A is unable to access the Internet. The administrator tries to ping a server on the Internet from PC-A and collects the debugs that are shown in the exhibit. Based on this output, what is most likely the cause of the problem? The inside global address is not on the same subnet as the ISP. 32. Which statement best describes a WAN? WAN is another name for the Internet. A WAN is a public utility that enables access to the Internet. A WAN interconnects LANs over long distances. 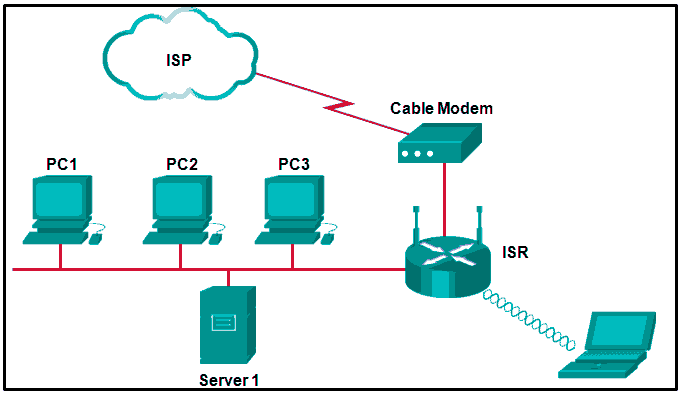 A WAN is a LAN that is extended to provide secure remote network access. Refer to the exhibit. Based on the configuration of R1, which device is the inside host and what is the inside local address of this host? The LMI types supported by Cisco routers are CISCO and IETF. The LMI uses reserved DLCIs to exchange messages between the DTE and DCE. The LMI type must always be manually configured. The available LMI types are CHAP and PAP. The LMI provides a virtual circuit (VC) status mechanism. The LMI type configured on the router must match the one used on the Frame Relay switch. 36. What type of installation is needed to view syslog messages? 38. What is the relationship between the DE and the CIR in Frame Relay? The DE bit will indicate when the CIR committed burst size should be applied. When the CIR on a given DLCI is exceeded, the DE bit of frames above the CIR is set. When the CIR is exceeded, an Inverse ARP DE message notifies the source to reduce frame transmission speed. The XON/XOFF flow control mechanism sets the DE bit when the CIR is exceeded. 39. What can cause a reduction in available bandwidth on a cable broadband connection? The encapsulation on the Serial0 interface is incorrect. What is the IP address or range of IP addresses that are used as the inside global address for packets that originate from PC1 and are going to the server? 43. An administrator needs to configure a router so that internal network servers are accessible from the Internet. Each server is configured with a private IPv4 address. What type of NAT should the administrator configure? 47. How many addresses will be available for dynamic NAT translation when a router is configured with the following commands? 48. In the Cisco Enterprise Architectures network design approach what is the purpose of the enterprise edge module? 49. How does STDM allocate bandwidth on a serial connection? It ensures that bandwidth is allocated to each channel or time slot regardless of whether the station using the channel has data to transmit. It ensures each of the time slices are assigned to individual conversations. It keeps track of conversations that require extra bandwidth. It then dynamically reassigns unused time slices on an as-needed basis. It statically assigns bandwidth based upon pre-assigned time slots. Refer to the exhibit. While planning an upgrade, a network administrator uses the Cisco NetFlow utility to analyze data flow in the current network. What generated the most packets? Publicado por El Guille en 9/06/2015 12:29:00 a. m.